Visitors to the UK cities of London and Manchester can now interact via NFC with 35 high-profile statues that have been given a voice by actors, comedians and writers, including Patrick Stewart, Jeremy Paxman and Hugh Dennis. 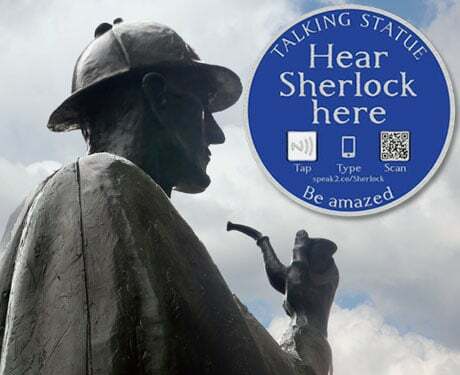 Visitors who touch their NFC phone to a plaque on one of the Talking Statues receive a historic, comic or fictional call back from the likes of Isaac Newton, Queen Victoria and Sherlock Holmes. A call back can also be initiated via QR or by entering a short URL that is shown on the plaque. Readers can take a “call” from legendary detective Sherlock Holmes, for example, by visiting speak2.co/sherlock on a mobile device. “Most of us hardly notice the statues around us. Talking Statues aims to change this,” says Colette Hiller, creative director of arts producer Sing London which collaborated with Antenna Lab and NFC platform provider Wooshping on the project.